Polished and slip-resistant textured pebbles design for foot massage makes bathing and showering more relaxing. Suction cups on bottom help keep mat firmly in place. Drain easily and fast. Made of high-quality durable vinyl. Beyond the Amazon's A-Z protection policy, you are backed by Surpahs' 100% satisfaction guaranteed program. Welcome to compare. 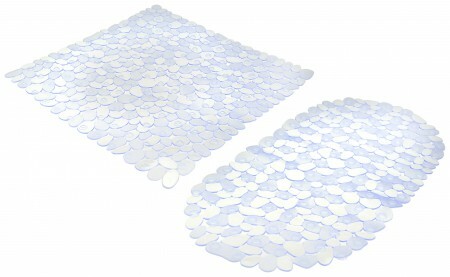 Surpahs Pebble Vinyl Non-Slip Bath and Shower Mat is a TWO Piece Bundle Pack, featuring an unique, organic pebble surface for foot massage which makes bathing more comfortable. The mat is suitable for bathroom, bathtub, kitchen, hotels, restaurants, hospitals, balcony, etc.